Another AIA Conference on Architecture has come and gone. 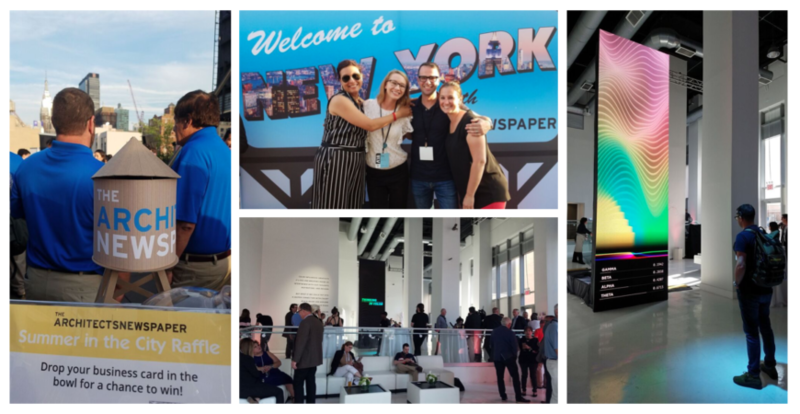 The immersive 2-day international architecture expo, which was held at the Javits Center from June 21st until June 23rd, welcomed an estimated 20,000 guests from all 50 states and 85+ countries. This year saw a return to New York City, an encouraging move after last year’s poorly received expo in Orlando, FL. While transportation to and from the Javits Center was challenging, especially with the $20 billion Hudson Yards mega-project across the street, the show was well-attended with positive comments from exhibitors and attendees. Ironically, the gridlock and hassle of navigating Midtown Manhattan meant that attendees spent more time than usual on the show floor, opting to stay for longer periods of time to avoid rush hour or the heat of walking through NYC on a sunny summer day. We were among those who spent each and every day walking the floor from open to close. But the fun didn’t stop there. From special events to off-site tours, the Stoner Bunting team crisscrossed the city as we met and learned from leaders in the architecture, design and manufacturing industries. Manufacturing environmentally-friendly products is old hat at this point. It’s not a trend, but rather an expected design attribute that will help architects and designers hit increasingly stringent USBGC LEED® standards. However, what is new is the focus on non-traditional recycling and reclamation opportunities from existing products. Designer Eileen Fisher, for example, has dedicated her career to challenging the ways of the fashion industry; with the announcement of Vision2020 in 2015, her company took a bold step in reaching its ambitious environmental and social goals which include materials, chemistry, water, carbon and conscious business practices. DesignWork, shown above, is the company’s latest initiative; a creative exchange between makers who felt and stitch consumers’ used garments into captivating wall hangings, upholstery and accessories for interiors, hospitality and public spaces. 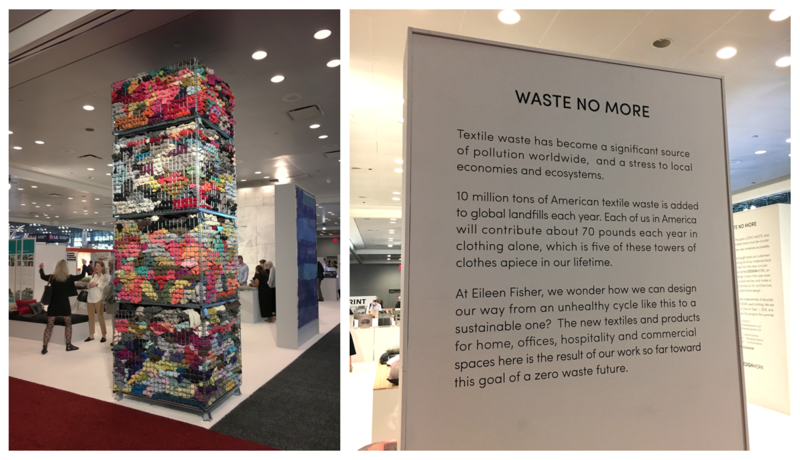 This was just one of several companies at the show focused on reclaiming materials that are otherwise destined for landfills here in the United States and around the world. 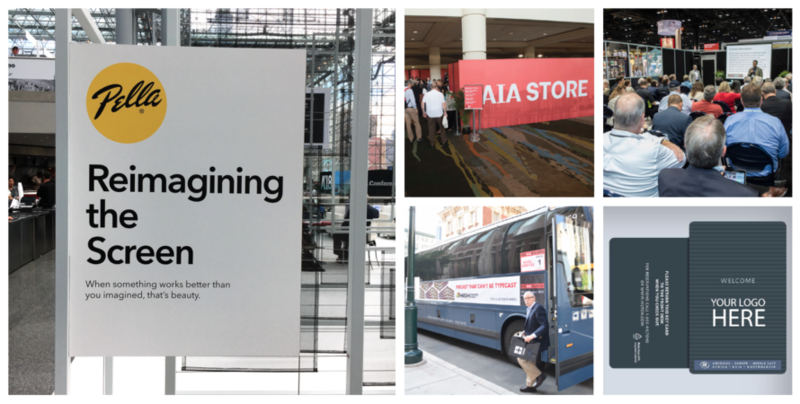 From bus wraps to key cards, AIA provided more ways than ever for brands to market their presence at the expo and drive quality traffic to their booth. Targeted sponsorships abound throughout the Javits Center and the surrounding area, with options geared to nearly any budget. 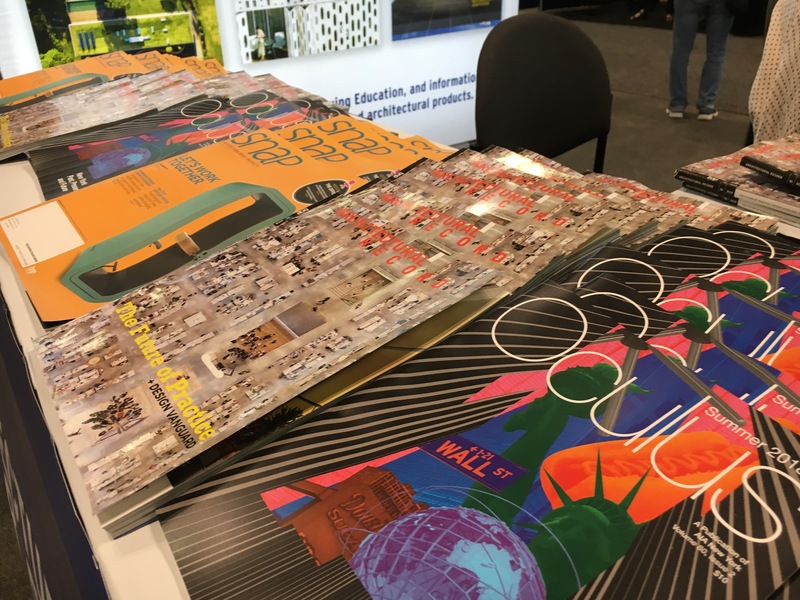 Companies like Pella stepped up their game with branded product integration in public spaces, while others opted for more traditional options like lanyards, expo hall banners and escalator clings. The result was an immersive, yet unobtrusive environment throughout the expo center. Special events like The Architect’s Newspapers AIA welcome party and the Sherwin-Williams “Thinking in Color” event brought together industry professionals in unique and fun ways. The Sherwin-Williams event, in particular, stood out with its brain wave reading device that displayed each user “color.” Our team had a mixed bag of results, with our auras displaying from blue to pink to white. How on-trend! Speaking of trends, booth design and engagement opportunities were a major step up from last year’s show in Orlando. From bold colors to incredible displays, the vast majority of companies and brands had fun-filled spaces that left lasting memories on showgoers. 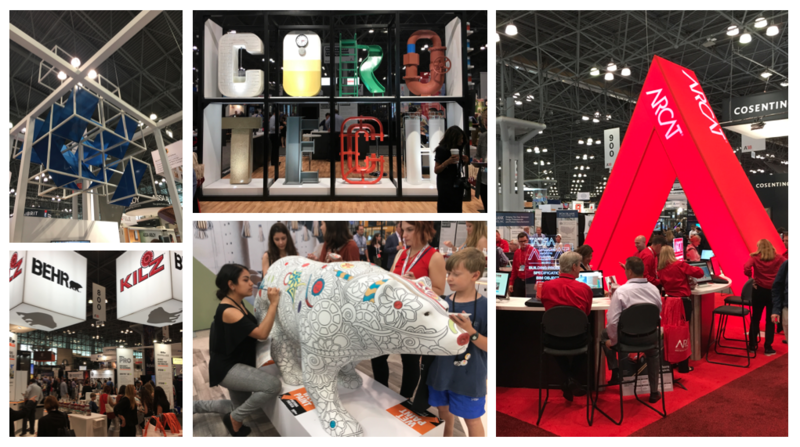 One of our favorite finds was the “Behr Bear.” Located at the center of the Behr Paints booth, it started off the show as an inconspicuous white polar bear and ended as a rainbow-colored expression of the A&D industry’s creative capacity. Even children got in on the action! Beyond manufacturer booths, there was large and strong media presence throughout the show. Being located in New York City, a publishing hub for our industry, was certainly a help. However, there was a general excitement and presence that was missing in Orlando. This spread over to private events pre-show, during the show and after the show ended. 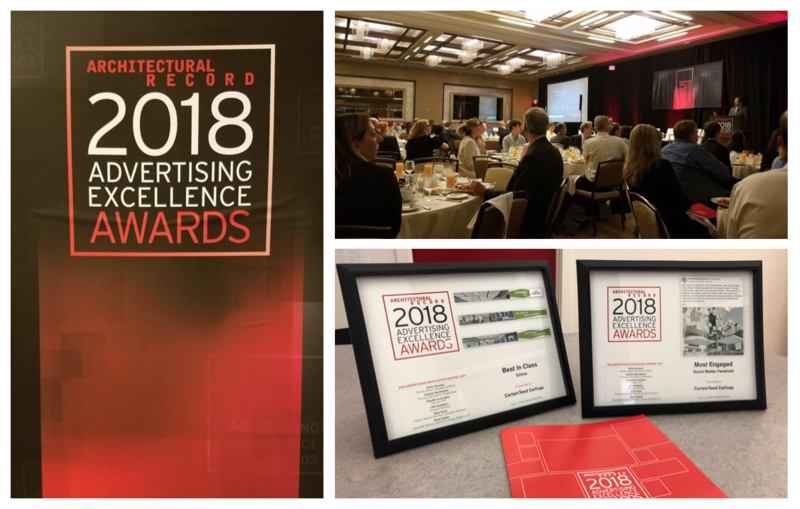 One highlight for Stoner Bunting was the Architectural Record 2018 Advertising Excellence Awards. We are a perennial winner, but this year’s show was both well-attended and produced. One of our favorite parts of this year’s show was the large, central stage at the Javits Center. Flanked by comfortable couches and other seating (including plenty for standing audiences) it was a popular forum for speaker seminars and panel events. The openness also made the speakers and presenters seem more accessible. They weren’t sequestered into a ballroom or separate hall, but on display for everyone from manufacturers, to architects to students and other visitors. It was a real highlight for our team. 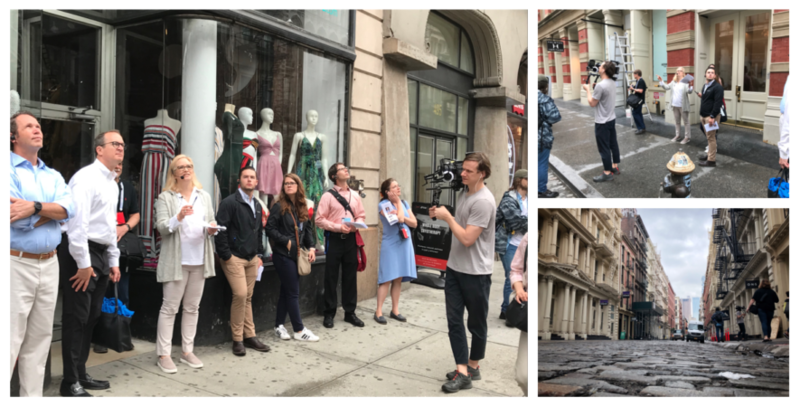 In addition to a full lineup of well-received speaker seminars and panel events, Stoner Bunting was on location for client CornellCookson’s sold-out Cast Iron Architecture Tours of Lower Manhattan. We’ll be featuring this immersive series of events in an upcoming blog post, so make sure to check back in the coming weeks for more information. While our list of key takeaways is in no way an exhaustive analysis of the AIA Conference on Architecture 2018, it offers a glimpse at what makes this expo a unique and important part of the A&D community and building products industry. A stunning 40% of show attendees are a principal or partner at their firm, with another 36% identifying as an architect, emerging professional, specifier or consultant. Considering more than three quarters of attendees are key decision makers, their feedback and brand exposure is a critical opportunity for companies big and small. It’s hard to earn or buy this kind of publicity, at least not without spending a huge amount of money. That’s why it’s so important to invest in the right show and the right strategy that will benefit your brand and result in positive engagement between you and potential clients on the show floor, an event, CEU or another touchpoint surrounding the expo. Are you attending AIA in 2019 or another architecture, design or building product trade show? Click here to learn how we can help.